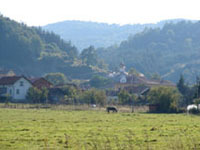 It is a known fact that the village of Belchin has been in existence since the times of Second Bulgarian Kingdom. It has been the bedrock of literacy and Christian spirituality. In the Turkish register of 1576, it is mentioned as a village with well-developed sheep breeding. The population used to be occupied in the business of ore-mining. According to Vladislav the Grammarian, in 1469 the Belchin dweller by the name of John the Presbyter took part in an embassy to transfer the bone relics of the saint Ivan of Rila from the city of Turnovo to the Rila Monastery. In his "Travels around Bulgaria", Constantine Irechek notes that he saw in the village of Belchin a prayer book dating from 1744. There are various legends and hypotheses, but certain research scientists refer the existence of the village back to the early antiquity - founded even by the Latins themselves. According to their description, it once used to bear the name of Tsari Mali Grad. In any case, we are dealing with a settlement that has a history of more than a thousand years, which is connected to the surrounding villages both through its type of livelihood as well as through their common traditions and culture. By the end of 2006, with the participation of various scientists and researchers, began the archeological excavations of an entire complex - a church, a necropolis, and a settlement rising immediately above the village which takes its history back by even more centuries. The medieval temple of "Saint Petka" - a national monument of artistic culture of the 1st class, was completely restored and became the object of more intense visits those who appreciate the artistic and cultural heritage. As it now stands, it was built in the 17th century upon the foundations of another temple from the 13th - 14th century. The temple possesses exceptional artistic value with its precious iconographic and wood-carving decoration. At the foot of the temple, an ethnographic museum house was built in the style of the Bulgarian national renaissance. The house is a branch of the museum in the town of Samokov, and items from the daily life and culture of the population of these lands are exhibited in it. To the long and rich history of the village of Belchin testify also the remains of the large fortress (ancient settlement) with a chapel located on the "Saint Spass" hill. The legends related to the Tsari Mali Grad find their corresponding evidence in the solid fortress wall built up of big hewn stones and of bricks even as early as the times of the Roman Empire. The discovered square tower, coins, luxury and daily life ceramics are witnesses of thriving trade, cultural, and metal extracting activities in the 4th - 5th centuries. The area around the village of Belchin - Belchin Baths is turning into a foundation for the development of modern European class cultural and historical, balneological, and eco tourism. Forthcoming is the realization of projects for the restoration and building up of other cultural monuments, for the setting apart of eco paths, for the organizing of local festivals, and for the rebirth of the local traditions.